Xero is a revolutionary web-based accounting system designed with the needs of small business owners in mind. Not the needs of their accountants! Many online accounting firms only offer their own in-house software. Our philosophy is that we’re accountants not developers, we can’t make the best software in the world and that’s what we want our client’s to use. For that reason we offer Xero, it’s quite simply the best. Xero automatically connects to your bank and pulls copies of your bank statements. From there it’s really simple to tell Xero what that transaction relates to. Once you’ve told Xero once it remembers and looks out for similar transactions. This saves a huge amount of time and makes keeping your accounts up to date a breeze. 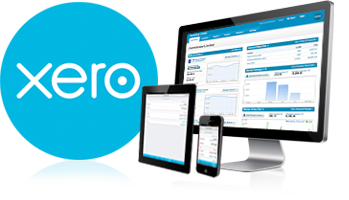 You can log in to Xero from any web browser, as your accountant we can log in too and see the same information. If you have a question we can see exactly what you are referring to and provide precise advice. The time when you had to wait six months after your year end to see your accounts and receive tax advice is over. Xero does away with accounting terminology. Your accounts are presented in plain english with powerful charts so you know exactly how much money you are making and the timing of your cash flows. You can access Xero from your iPhone or iPad. Wherever you are. See your cashflow in real-time. Just log-in anytime, anywhere. Integrate Xero with other online systems like PayPal, Shopify and SalesForce. In addition to the Xero web-app we provide access to the Xero Touch iPhone & Android app. The app allows you to send sales invoices, enter expenses and reconcile your bank on the go.